This emerald pesto is ideal when the weather starts to warm up – the mint adds a springy note while the basil offers a hint of summer to come. Stir it into Maria Speck’s Speedy Chickpea Couscous with Pesto, serve a dollop atop fish or poultry, spread it on crostini or add it to hot pasta. 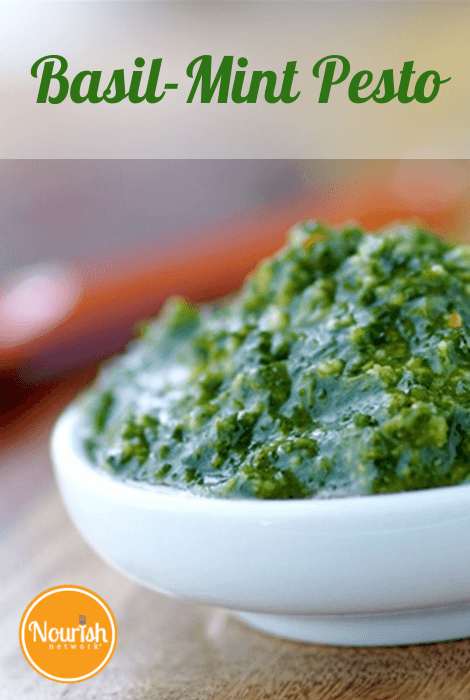 This pesto recipe yields a generous amount. Use whatever you need now, and freeze the leftovers in an ice-cube tray. Once it’s frozen, pop the pesto cubes out of the tray and transfer them to a heavy-duty zip-top bag and freeze up to 1 month. Place the nuts and garlic cloves in a food processor or blender; pulse until coarsely chopped. (Or make your pesto the old-school way and pound it in a mortar and pestle.) Add basil and mint; pulse until coarsely chopped. Add oil and juice to taste; pulse to combine. Season to taste with salt and pepper.